This could be the headline reporting on British Land‘s construction site at 2-14 Baker Street operated by McAleer & Rushe. 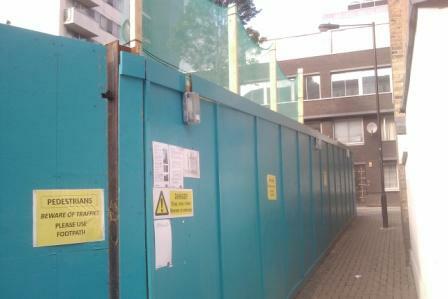 After many months (nearly 10) of site safety failures, serious health and safety lapses and procedures necessitating interventions by Westminster City Council – it seems they continue to ignore BASIC health and safety practices – preferring what appears to be the cheapest ‘quick fix’ solutions. The picture above is taken at the rear of the British Land site at ‘2-14 Baker Street’. This image is taken to the rear of the site at a narrow pedestrian walkway between Baker’s Mews and Robert Adam Street. The roadway alongside this pedestrian walkway was closed off 10 months ago without consultation. It is probably illegal in that a lighting standard in the pavement prevents access to wide wheelchairs, parents with wide buggies and the infirm. It also a death trap. Residents have been complaining about the site at ‘2-14 Baker Street’ to Westminster City Council, to British Land and to McAleer & Rushe since early in the year about the dangers of this site to members of the public. This includes real dangers posed continuously to date to children living in the vicinity of the site. But many of these legitimate complaints about the site at ‘2-14 Baker Street’ have not been taken seriously either by British Land or by McAleer & Rushe. Westminster have had to put a consultant on the site in an effort to ‘hand-hold’ the site staff and to ensure that normal and proper safety practices are observed and implemented. But the failures continue. So here we have a site (2-14 Baker Street) that was not fenced to the rear whilst a major demolition of a building took place – allowing unimpeded access to anyone who wished to wonder under falling masonry and amongst dangerous machines. Work currently involves a digger (visible in the photo) working daily alongside the pedestrian walkway from Baker’s Mews to Robert Adam Street. Residents, including the author of this post, have observed material falling out over the top of the fence onto the roadway and pedestrian walkway. The company appears to have realised it must take action. Logic would suggest a rigid structure and in the way of a heightening of the perimeter fence – and/or covering the pedestrian walkway so as to fully exclude the danger of injury or death to passers by. Logic would also suggest that such works in proximity to pedestrians is dangerous and should cease. But obviously the considerations for a solution have been based on ‘how cheaply and quickly’ this can be done in preference to meeting proper safety standards and legal and site operational requirements. So what has been erected appears to be a flimsy piece of netting. It appears to be held in place using plastic cable ties – which would offer little or no resistance to the might of a mechanical digger or heavy construction debris. The netting does not extend very far and does not include the site entrance over which some site materials were seen falling in the past week. And this is supposed to pretect pedestrians including children and infants from falling site material including concrete, soil, rocks and rubble. Will it take the death or serious injury of a child or other passer by before proper action is taken against McAleer & Rush and British Land in respect to the woeful failings that continue at ‘2-14 Baker Street’? Where is the public best interest in all of this? Why are the litany of safety failures allowed to continue week in and week out on this site at ‘2-14 Baker Street’? Is it that McAleer & Rushe are finding it difficult to service their loan portfolio with NAMA in Ireland – or are they simply a company whose mindset is to cut corners and cut costs at the expense of their legal obligations? Some of the questions raised about this site at ‘2-14 Baker Street’ and about McAleer & Rushe by the blog NAMAWineLake may be well worth revisiting. This entry was posted in 2-14 Baker Street, Boris Johnson, British Land, Building Site, Child Safety, Children, Commercial Development, Congestion Charging London, Construction, Construction Deaths, Death, Disabled Access, HSE, London, London Mayor, London Olympics, Mayor of London, McAleer and Rushe, Mob, NAMA, Parking in London, Retail Development, Street Parking in Marylebone, Street Parking in Westminster, Tax Avoidance, Thug, Thuggery, Tourism London, Uncategorized, West End, Westminster, Westminster City Council, Where to park in London and tagged 2-14 Baker Street, Baker, Baker Street, Bank of Ireland, Boris Johnson, British Land, Business, Central London, Children, Company, Considerate Builders, Construction, construction site safety, Death, Disabled Access, Disabled Rights, Health and Safety Executive, HSE, Injury, KPMG, London, London Olympics, Mayor of London, McAleer & Rushe, McAleer and Rushe, Mob, NAMA, NAMA Wine Lake, NAMAWineLake, National Asset Management Agency, News, Northern Ireland, Occupational safety and health, Pedestrian, Retail Development, Robert Adam, safety, West End, Westminster, Westminster City Council. Bookmark the permalink.